This heirloom bean came originally from the Arikara tribe of North Dakota. They were introduced in Oscar Will’s Pioneer Indian Collection of seeds in 1915. They are excellent for use as a baked bean or for soups. I chose this variety for it’s earliness and it’s drought tolerance. While I have not been able to test the drought tolerance yet, I can attest to it’s tolerance for cooler than normal temperatures and excessive rains. Being a bush variety poses its own problems in areas with rainy, humid summers. Arikara performed well, with good yields, in one of the wettest summers (2014) I can remember. I did tie up the short plants to keep the maturing bean pods off the ground. I planted on May 27th and harvested my first mature pods on August 15th (79 days). I finished the harvest 10 days later. I recommend that, here in Northern Indiana, dry bush beans and half runner beans (not soybeans), should be harvested over a period of time rather than pulling the whole plant when it is fully dry. By removing the mature pods as they begin to dry, and allowing the rest to further mature, ensures the maximum yield. In an area with frequent summer rain, the lowest early maturing pods will become moldy, rot or begin to sprout before the rest of the beans are mature. After each picking, I bring the pods indoors and lay them out on newspapers to further dry before threshing (usually a couple of weeks). Threshing is easily accomplished by putting the pods into a pillow case and gently stepping on it until all the pods have split and released the beans. If the beans are not dry enough, this process can crush them, rendering them unsuitable for long term storage and replanting. I winnow in front of a fan. If you have a large amount and intend long term storage, I also recommend allowing the shelled beans to dry a few more weeks and then putting into airtight containers and freezing for 5 days to eliminate any insect larvae lurking inside. 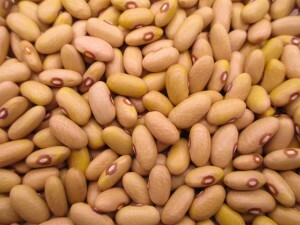 Freezing before the bean is dry enough can “kill” the seed, leaving it useless for replanting. An easy test to see if they are ready for freezing and storage, is to smack a few beans with a hammer. If the beans break apart into pieces, they are ready for freezing and storage. If they just flatten out, the moisture content is still to high, and you should allow them to dry a couple more weeks. Seed Saving: Isolate from other Phaseolus vulgaris varieties by 25′ for home use, and 100′-150′ for pure seed. I am looking for Arikara Corn seeds for our traditional garden. I do not have any seed but I have a friend, Stephen Smith, who has a vast collection of Native American corn varieties. I asked him about Arikara varieties specifically. via email at bcreekcorncurator@gmail.com Hope this sends you in the right direction.